The end of the first quarter of the year is always the most exciting time for lovers of Android smartphones. In fact, not only is the end of the quarter interesting, it is the whole quarter. It starts with the CES of Las Vegas and ends just after the celebration of the MWC in Barcelona, not to mention the many exclusive events that manufacturers have over these months. In 2017, the first quarter will be remembered by the official presentation of the LG G6 and the Samsung Galaxy S8, and by the advances that begin to produce a few days of the celebration of the conference dedicated to the mobile technology. 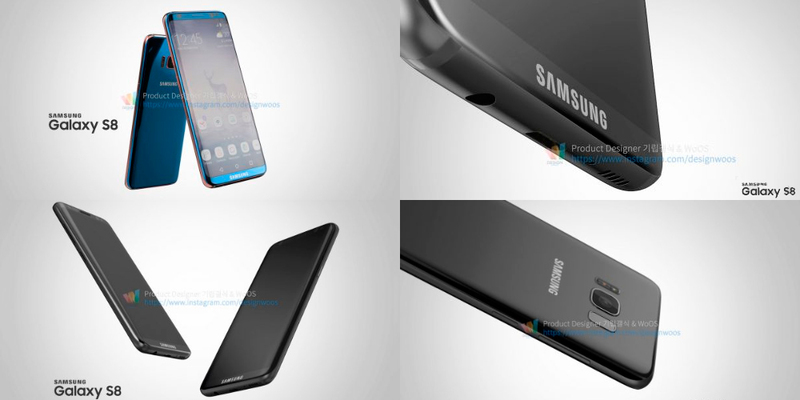 The images of the Samsung Galaxy S8 show that Samsung has decided to further minimize the edges around the display with Super AMOLED technology while at the same time maintaining the layout of the various sensors and the company logo. Still in the upper part are the plastic inserts used to improve the transmission of power through the antennas. Despite the images, we remember that this information is based on the latest rumors surfaced online and not on official information. Of course, once the reduction of frontal edges is confirmed, and the absence of a start button (with the consequent displacement of the fingerprint reader on the back of the smartphone to the left of the rear camera). The presence of a new physical button that will surely be used for the activation of Bixby, the virtual assistant that Samsung has developed and premiere just with the launch of the Galaxy S8, is confirmed. Unlike the Galaxy S8 (whose images and rumors have been on the net for a long time), the image that represents the alleged LG G6 screen is more surprising and unusual. LG's new top-of-the-range smartphone could have top and bottom front edges, but not to the sides (where it would resemble the design of the Galaxy S7). The image shows precisely what appears to be the front of the LG G6. In the lower part we only find the LG logo, while at the top the camera is located, the light sensor, the proximity sensor, and the speaker. The image of the leaked LG G6 shows a white smartphone that shows a certain resemblance to the LG G2 and the LG G3. This is not the first time that the Korean giant tends to minimize the size of the edges of its cell phones, although the previous models did not reach this level. Again, we recall that this is, in any case, information not confirmed by the respective manufacturers, and therefore has to be taken with due care.